Imagine that the entire globe is at your fingertips. 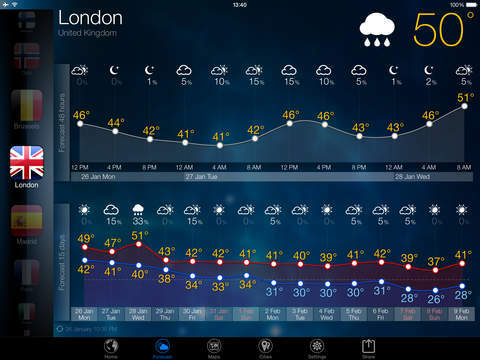 Never before has getting weather information been as exciting and interactive as it is in the “3D Earth” application. 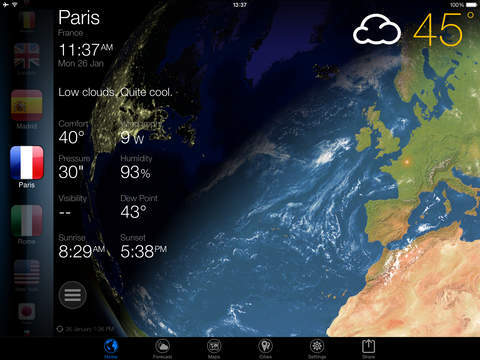 The main features of “3D Earth” are the “home screen” and the forecast page with a unique way of scaling the charts. On the “home screen”, you can get information on the selected location such as local time and current weather with detailed weather conditions, and, of course, an incredibly beautiful three-dimensional image of the globe with realistic-looking atmosphere, the sun and the stars. You can manually turn it, increase and decrease its size, run the slow spinning animation or stop it. Installed in a cradle or dock station, the application can run as a screensaver, attracting your friends and fellows. The current weather data is gathered from thousands of professionally installed and maintained weather stations installed mostly at airports. 3D Earth only shows current weather from stations that have reported local weather conditions within the past hour. Current weather data is refreshed every 30 minutes; that is twice as frequent as most other weather providers can offer. Unique 48-hour forecasts from over 80,000 locations around the world provide a level of coverage and detail that simply cannot be found elsewhere. If you have any problems with installation or in-app purchase, found bugs, questions, comments about this application, you can visit the official website of Dmitry Alaev at http://www.badmonkeyteam.com. Hello. Minor bugs fixed, widget problem solved, EU users consent status added, may be small bugs added. 3D Earth HD with weather info, forecast and temperature on the icon.